If you don't have a Kinect sensor, you must purchase both an Xbox Kinect sensor and the Kinect Adapter for Windows. The Kinect Sensor and Kinect Adapter ceased manufacturing in November 2017. 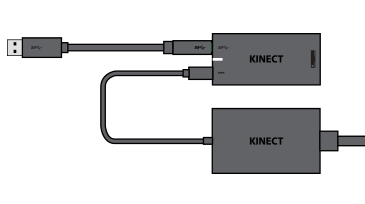 Microsoft no longer carries inventory of the Kinect Adapter. Customers can check other retail stores for Adapter availability. Note Previous versions of the Kinect sensor for Windows included both a Kinect for Windows sensor and an adapter with a power supply. Note Some of these recommendations link to relevant Kinect for Xbox One information. Make sure your computer is running Windows 8 or a later version. For more information, see the “System requirements” section below. Make sure you’ve installed the latest drivers from Windows Update. Center the sensor horizontally in front of your monitor or screen. Or, follow the instructions in the setup application. Place the sensor on a flat, stable surface, away from any edges. Do not place the sensor on a stereo speaker or vibrating surface. Make sure the front of the sensor is not obstructed by power cords, computer cables, or other solid objects. Make sure the Kinect sensor is in a well-ventilated space and its vents are not covered. Keep the sensor out of direct sunlight. Keep background noise low to minimize possible voice-recognition issues. For example, don't place the sensor near a fan, stereo speaker, or loud machinery. If you're using a mounting accessory, make sure you mount the sensor correctly. Have a question about your Kinect for Windows sensor? Go to the Kinect for Windows FAQ for the latest information and answers to frequently asked questions. Would you like to contact Support regarding the "Set up Kinect for Windows v2 or an Xbox Kinect sensor with Kinect Adapter for Windows" issue you were reading about or a different issue?